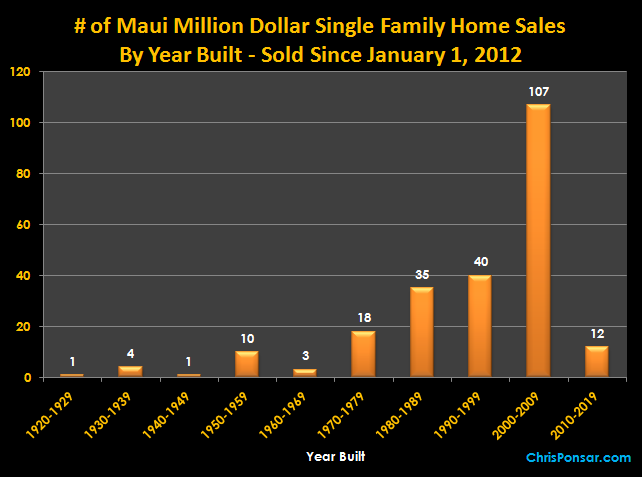 More than 50 percent of the Valley Isle’s million dollar home sales have been built since 2000, with 84 percent constructed since 1980. Bottom Line: Newer is better, no surprise here. As wealthy buyer preferences for residential real estate evolve over time, the luxury segment is quick to adapt. For example, solar energy and “great rooms” are in, rear projection television nooks and galley kitchens are out. Although they are usually built to high construction standards, an appraiser often observes that residences in the high-end/second-home market can have economic lives that are are shorter than less expensive dwellings–sometimes meaningfully so. A future article will identify a case study or two where ultra-high end oceanfront homes in Hawaii were torn down for land value/redevelopment, despite being less than 20 years old!